The Permian through Jurassic lithostratigraphy of the Colorado Plateau area of southeastern Utah that makes up much of the famous prominent rock formations in protected areas such as Capitol Reef National Park and Canyonlands National Park. From top to bottom: Rounded tan domes of the Navajo Sandstone, layered red Kayenta Formation, cliff-forming, vertically-jointed, red Wingate Sandstone, slope-forming, purplish Chinle Formation, layered, lighter-red Moenkopi Formation, and white, layered Cutler Formation sandstone. Picture from Glen Canyon National Recreation Area, Utah. A lithostratigraphic unit conforms to the law of superposition, which state that in any succession of strata, not disturbed or overturned since deposition, younger rocks lies above older rocks. The principle of lateral continuity states that a set of bed extends and can be traceable over a large area. 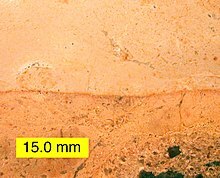 Lithostratigraphic units are recognized and defined on the basis of observable rock characteristics. The descriptions of strata based on physical appearance define facies. Lithostratigraphic units are only defined by lithic characteristics, and not by age. Stratotype: A designated type of unit consisting of accessible rocks that contain clear-cut characteristics which are representative of a particular lithostratigraphic unit. Lithosome: Masses of rock of essentially uniform character and having interchanging relationships with adjacent masses of different lithology. e.g. : shale lithosome, limestone lithosome. The fundamental Lithostratigraphic unit is the formation. A formation is a lithologically distinctive stratigraphic unit that is large enough to be mappable and traceable. Formations may be subdivided into members and beds and aggregated with other formations into groups and supergroups. Diagrams showing stratigraphic relations: A: an angular unconformity; B: a disconformity; C: a nonconformity. Two types of contact: conformable and unconformable. Conformable: unbroken deposition, no break or hiatus (break or interruption in the continuity of the geological record). The surface strata resulting is called a conformity. Two types of contact between conformable strata: abrupt contacts (directly separate beds of distinctly different lithology, minor depositional break, called diastems) and gradational contact (gradual change in deposition, mixing zone). Unconformable: period of erosion/non-deposition. 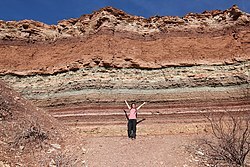 The surface stratum resulting is called an unconformity. Angular unconformity: younger sediment lies upon an eroded surface of tilted or folded older rocks. The older rock dips at a different angle from the younger. Disconformity: the contact between younger and older beds is marked by visible, irregular erosional surfaces. Paleosol might develop right above the disconformity surface because of the non-deposition setting. Paraconformity: the bedding planes below and above the unconformity are parallel. A time gap is present, as shown by a faunal break, but there is no erosion, just a period of non-deposition. Nonconformity: relatively young sediments are deposited right above older igneous or metamorphic rocks. To correlate lithostratigraphic units, geologists define facies, and look for key beds or key sequences that can be used as a datum.